Wiley Not-for-Profit GAAP 2016 is a thorough examination of the authoritative standards for measurement, presentation and disclosure as applied to not-for-profit organizations. Due to these organizations' unique characteristics, not-for-profit accountants must adhere to specific Generally Accepted Accounting Principles (GAAP). These requirements are complex and ever evolving, but this single volume brings them together, providing the most up-to-date information available. Flowcharts and diagrams are used to assist the reader's understanding of the material. Additionally, a financial statement disclosure checklist facilitates GAAP adherence. Designed specifically for accountants in public practice and industry, this guide covers requirements from all relevant organizations, including the Financial Accounting Standards Board (FASB) and Accounting Principles Board (APB). Technical and accounting research bulletins are clearly and concisely summarized, as are all statements of position important to not-for-profit organizations. Together, these resources make Wiley Not-for-Profit GAAP 2016 a complete reference tool for auditors and financial personnel in the not-for-profit sector. Preparers and auditors of not-for-profit accounts must stay up-to-date on the latest GAAP practices to best serve the organization, while complying with all disclosure, reporting and regulatory requirements. 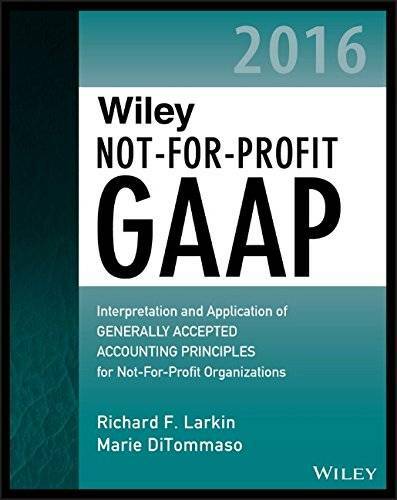 Wiley Not-for-Profit GAAP 2016 provides extensive coverage and practical advice on the latest GAAP, tailored to the not-for-profit organization's unique needs.